Wisdom teeth are our last 3rd molar teeth to develop and erupt into the jaw bone with the rest of the other teeth. They start developing at the age of 16 as teeth without roots and begin migrating up and out. Often at age between 19 to 21 most wisdom teeth would have pushed up through the gum and line up with the rest of other teeth. However, majority of time there is no room or space for the teeth to erupt into and they will be termed as impacted wisdom teeth. There a few technical term dentist use to classify the severity of impaction and they include: horizontal, vertical and distally impacted. Most of these impacted wisdom teeth will need to be surgically removed. At Amazing Smiles our dentist have experience in dealing with most surgical impacted wisdom teeth. Why are OPG needed to see wisdom teeth ? Initially, the dentist will take an orthopantogram (OPG) to assess the position of the tooth and it’s relationship to other teeth, nerve, blood vessels or sinus. Sometimes with difficult root structures or close to nerves the dentist may need to take a special 3D x-ray called a Cone Beam x-ray. What is General anaesthetics for wisdom teeth removal? The dentist can give patient option of having the wisdom teeth removed under general anaesthetics or local anaesthetics. General anaesthetics is a procedure where the patient is put to sleep by the anaesthetist at the private hospital. General anaesthetics will require patient to be booked into the local private hospital for day surgery where they will be admitted in the morning and released in the afternoon. The procedure can take longer than 1 hour depending on how many teeth to be removed and how difficult it will be. The patient will be given instruction on how to take care for after extraction and medications. How about Local anaesthetic procedure of wisdom teeth extraction? Patient can choose to have a “green whistle” Penthtox to use to help relax during local anaesthetic extraction. The dentist once identified the site is numb and patient only feels pressure then can proceed to open and expose the wisdom tooth. At Amazing smiles the dentist have the latest dental equipment like peziosurgical handpiece to make removing teeth a whole lot quicker and less trauma to the tissue. This is excellent for the patient as it will mean faster healing and less pain for the patient. Once the tooth is removed the tissue is sutured back closed. The patient will be given post operative instruction. This instruction include: minimal rinsing in the first 48 hours and lightly brushing around all teeth. Rinsing is possible with Luke warm water after couple of days and taking anti inflammatory tablets (eg Neurofen) for pain relief. Cold pack can be placed on the outside cheek area to help reduce swelling. 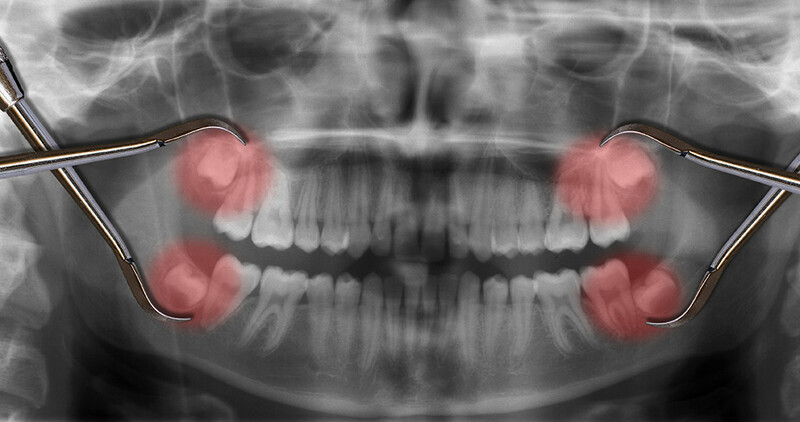 Why do wisdom teeth cause so much pain? Gum infection around wisdom tooth which is called pericoronitis. This is where the wisdom tooth (most often the lower) is only partial erupted and there is a flap of gum around the tooth that gets infected if it is not clean. Often the gum would be red and swollen. In severe cases there will be a pus discharge from the area and even swelling outside of the face. This will lead to restriction in opening. The treatment for pericoronitis will depend on the severity but initially can give patient a course of antibiotic, clean out the gum with ultrasonic or even taking our the offending tooth. On rare circumstances it maybe related to the top wisdom tooth biting down on this gum and causing this trauma. So taking out the top wisdom tooth is a recommendation. Decay in wisdom tooth can be a source of pain. This where the decay is so large that it has cause nerve damage and a toothache. Impacted wisdom tooth causing decay to the adjacent tooth. This decay maybe large enough to cause nerve damage to this adjacent tooth. Can we leave wisdom teeth and not remove them? Uninterrupted wisdom teeth can form benign cyst which can lead to damage and weakening of jaw bone. Horizontal Impacted wisdom teeth can cause decay to adjective teeth. This may lead to that tooth needing extensive work like root canal therapy. Movement of other teeth as the wisdom teeth try to push through. This certainly important with patient that have had orthodontic treatment.